Instructor User Guide Tests and QuizzesHow do I create a survey? Zoom: For a basic survey, select Survey from the drop-down menu. 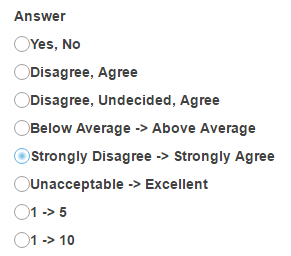 Zoom: For a matrix of choices survey, select Survey - Matrix of Choices from the drop-down menu. Input the desired choices for Row Choices and Column choices in the corresponding boxes. Press Return after each choice to separate th items.